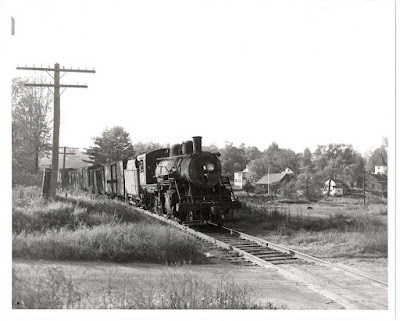 Went railfanning in Old Saybrook yesterday, circa Autumn, 1948. 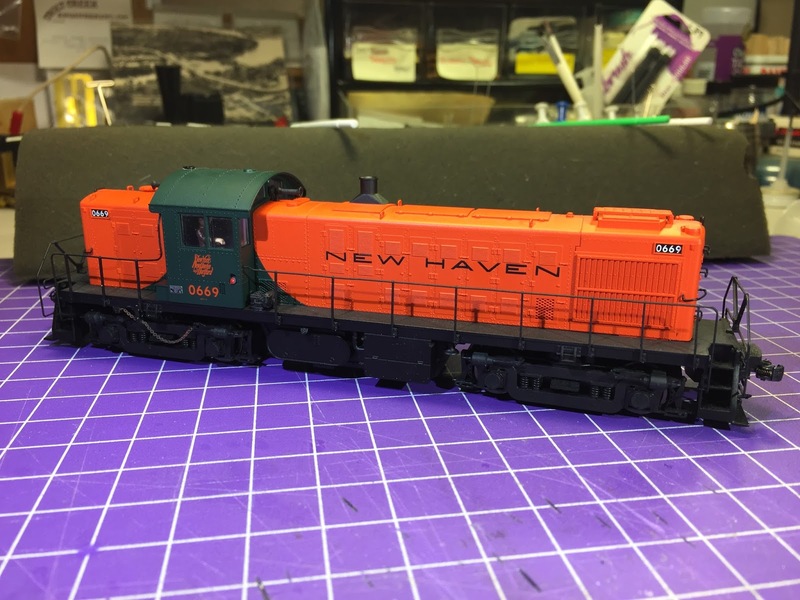 The DERS-1s are getting a little worn, having run millions of miles for the New Haven - and the US of A - throughout the war, but the newly-delivered stainless steel coaches provide a bright contrast to the weathered diesels. The films are admittedly not that great, but what do you expect from 1948? At least they're in color! Don't want to steal too much thunder here, but suffice it to say that I know this book has been years in the making and draws from the largest Valley Line-related collections available. 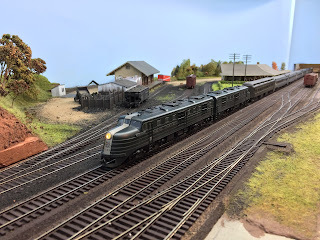 Thanks to fellow Valley Line aficionado Dave Messer for the heads up! What a fascinating - and frustrating - hobby this is! It offers an amazing amount of depth and breadth - everything from carpentry, electronics, art, scenery, architecture, historical research - but who has the time or money (or either!) to do any more than scratch the surface? 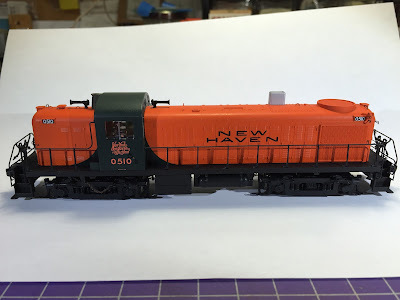 The best model railroads balance all these wonderful aspects into a cohesive whole. And almost all model railroads risk teetering off that balance into a rabbit hole . . . Ever since I decided to expand my erstwhile Valley Line to Old Saybrook, I was quickly swamped by the sheer amount of traffic on the New Haven RR's Shore Line - 71 trains every day! 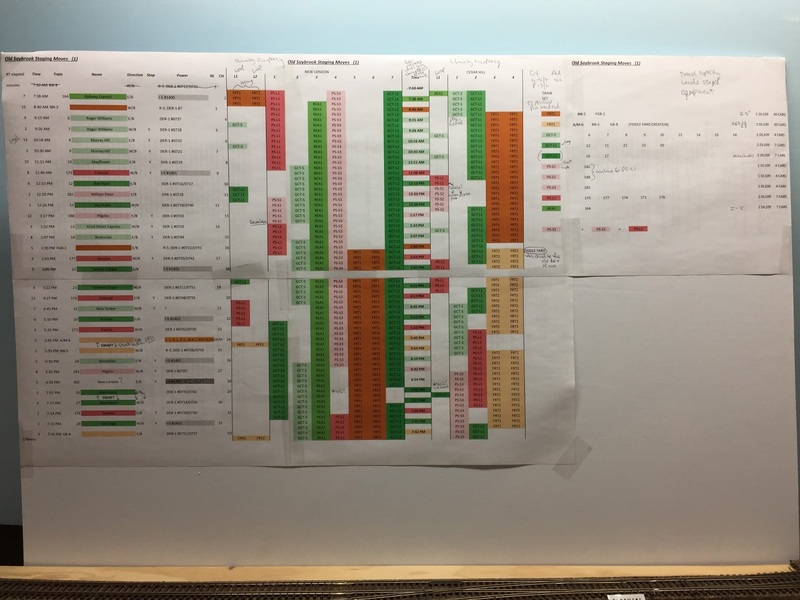 I (thought I) got around this a bit by being clever - reducing this schedule to just 4 mainline trains. But the prospect of capturing - even if only as sand through one's fingers - just a sense of the magnitude of this traffic and - better yet! - having it as such a dramatic contrast to the branchline operations, has proven much too much to resist. 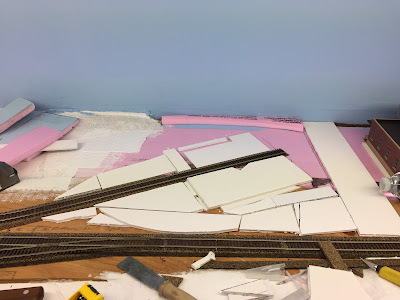 Consequently, I've gone from "just" having the Saybrook Scene and "a few staging tracks at each end" to expanding & cramming as much staging as possible in what little space I have left in order to try and accommodate as many of the trains as I can. And even that's just barely adequate. Friend Bill Chapin was no help at all a wizard when it came to figuring out that I COULD actually run ALL the trains that ran through Saybrook from 7:38am to 7:42pm. At least in theory. You really should click on this to enlarge it. It's truly impressive. All the trains are color-coded and shown on the staging tracks where they originate and terminate. 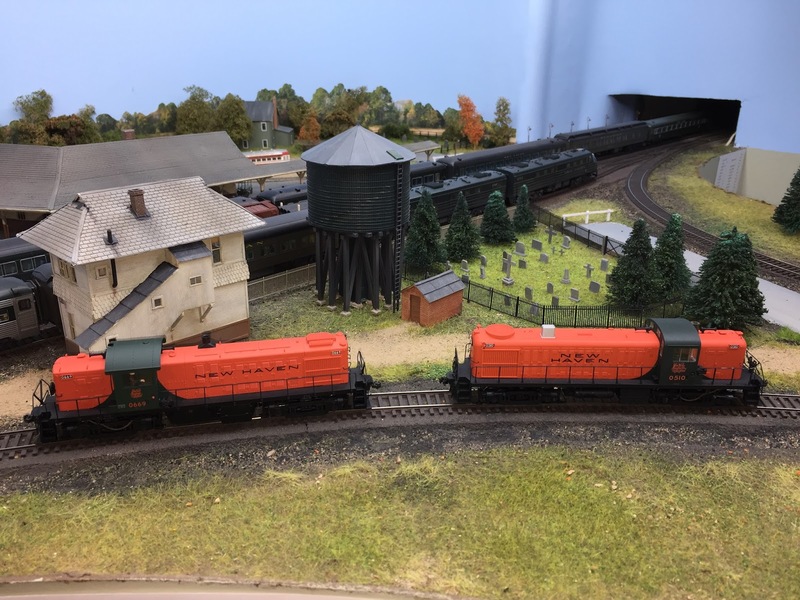 The colored times in the column between New London staging and Cedar Hill staging show what train is going through Old Saybrook at what time. 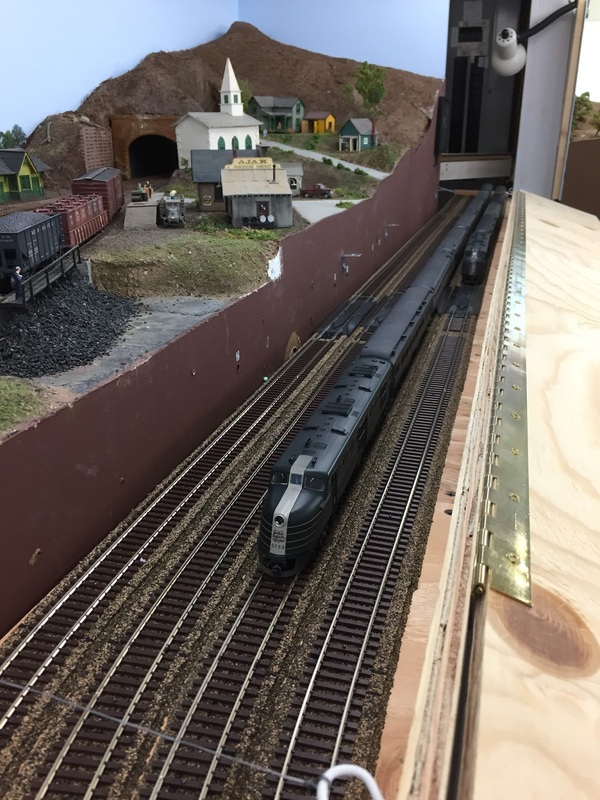 Also indicated are the actual prototype times, train numbers, train names, and whether they stop at the Saybrook station. Following the track numbers downward, you see how long a particular staging track is occupied. It all "works on paper" - last night I staged it, and a couple victims of us will try to operate it tonight. Yeah, I'm a loooooong way away from the meandering, once-a-day Valley Local. At least for the moment. And - believe it or not - this isn't even the squirrel distraction rabbit hole that prompted this post. One of the keys to what BillC did is that the passenger trains are "generic" and the consists are repeated. (Un? )Fortunately, I only have the consist books from 1942 and 1950. I model Autumn, 1947 (or 1948, or '49 - depending....) so I have plausible deniability regarding the "proper" consist. But look at the difference! In 1942, it was mostly heavyweight equipment, three Parlor Cars, and a few Osgood Bradley streamlined coaches. 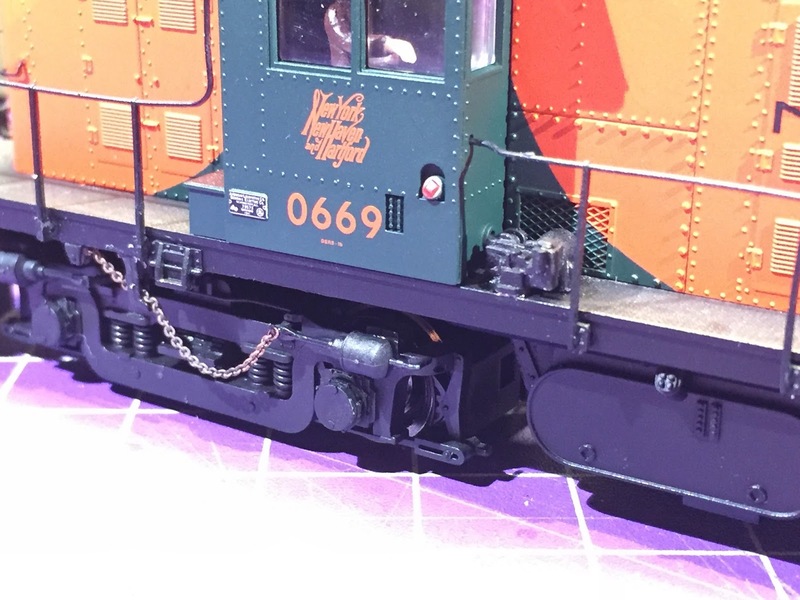 By 1950, there were only 2 parlors and most of the equipment was stainless steel coaches. And, as it happens, those stainless steel coaches were delivered in 1948. 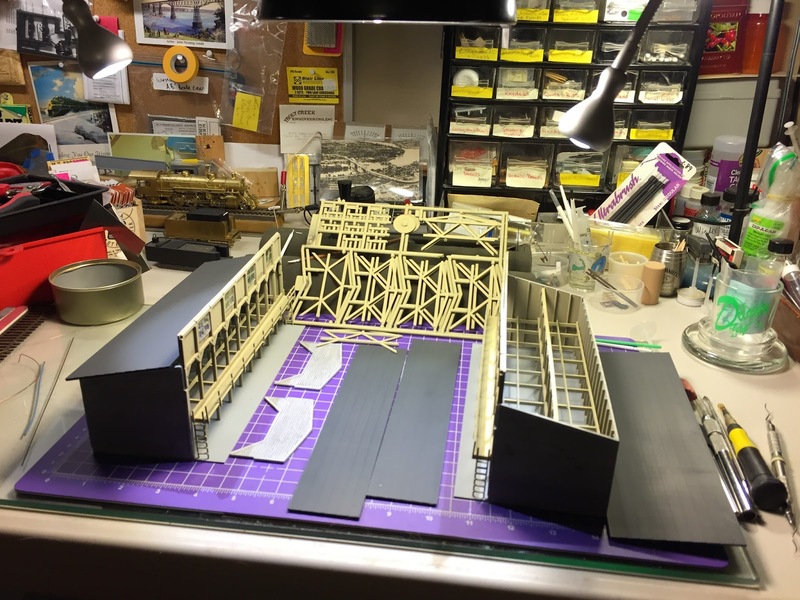 So, what does the Yankee Clipper that runs through my model of Old Saybrook look like? Well, right now, it has "whatever I can get my hands on." And, for the sake of my sanity (not to mention, my bank account), that might just have to do for now a while. In the meantime, at least that aspect of our broad-shouldered hobby called "historical research" costs me nothing. Just a lot of very enjoyable time . 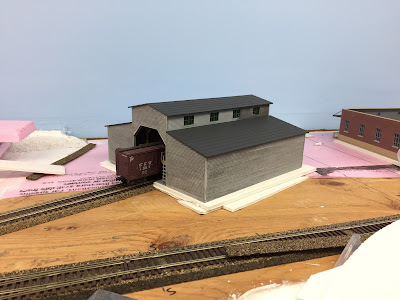 . .
Now that I finished the Wethersfield Lumber Co. shed, it was time to put it back on the layout. The siding goes across a-slightly-uneven joint between the plywood and foam board, and I also wanted to raise the shed in order to lower the track relative to the shed floor. The photo above shows a couple of things: 1) the necessity of lowering the track (I want the tops of the rails to be about even with the top of the shed's floors; and 2) how empty and clean the inside of the shed is. 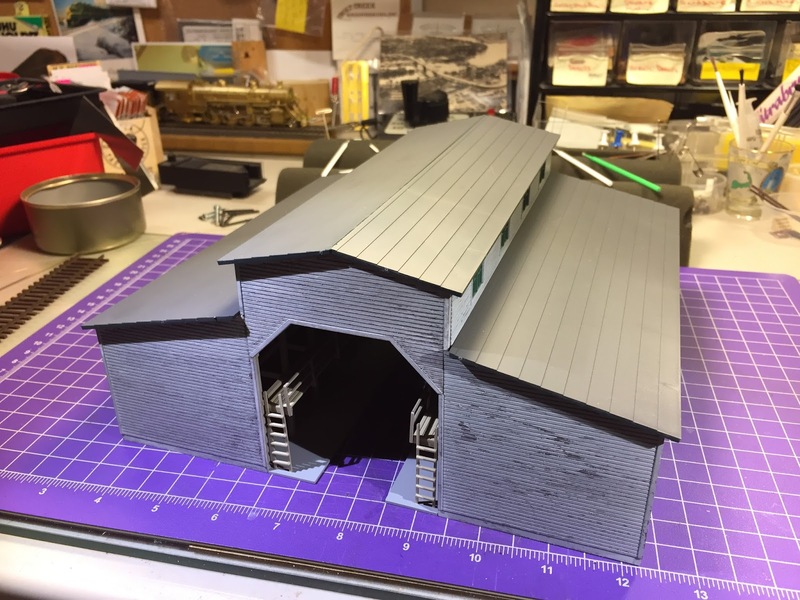 This is one of those times when I think I moved too fast, putting the roof on the shed before weathering and detailing the interior. 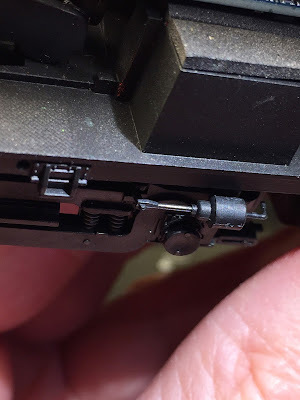 Any suggestions on how to remedy this (short of undoing the assembly that I did!) would be most appreciated! This is a better view of the layered foam core I used to provide a nice level, heightened base for the shed. 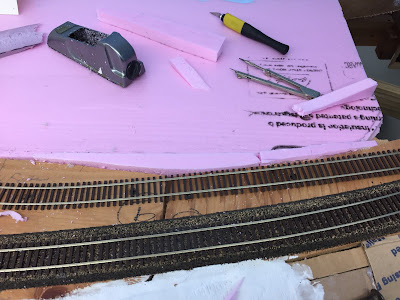 I used full-thickness HO cork roadbed until I got to the foamboard, then N scale cork in the shed. 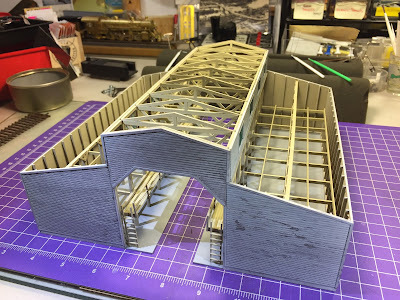 With the shed resting on the foam core, and the track on the N-scale cork, the shed's floors were at the right height in relation to the tops of the rails. Raising the shed required the surrounding topography to be raised a bit as well. 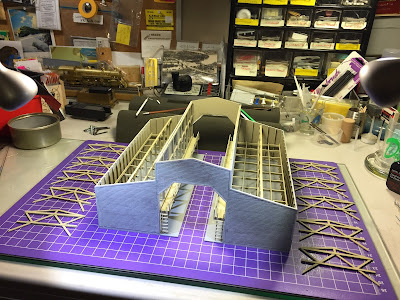 I could have troweled on an extra-thick layer of ground goop, but decided to save some of that by hot gluing scraps of foam core around as "fill." 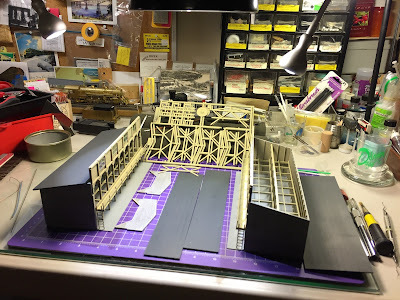 While that was drying, I decided to move over to the Ballantine's Beer Distributors site (click here for more about the Ballantine's industry). Again (poor planning I guess), the track of the siding spanned the joint between the plywood and the foam and the foam was a little too flexible for my liking (this was back when I used 1" foam; now I used 2" for a base). Instead of replacing the 1" foam, I decided to brace it with some scrap 2". As you can see above, all it took was hot gluing the 2" foam to the bottom, and holding it in place until the glue cooled. 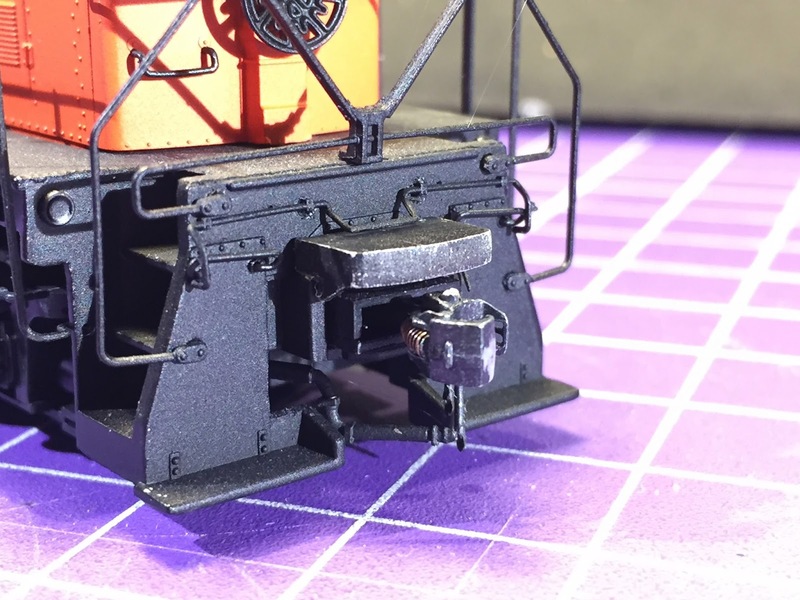 Problem solved: no more flexy! 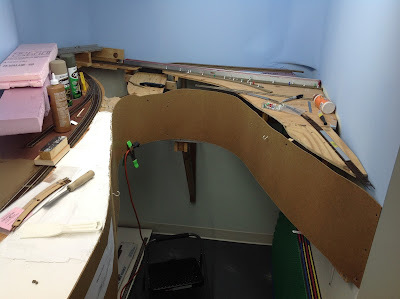 In the photo above, you can see I hot glued some scrap foam to fill in a gap where the track will go. I then rasped it down to level everything out. 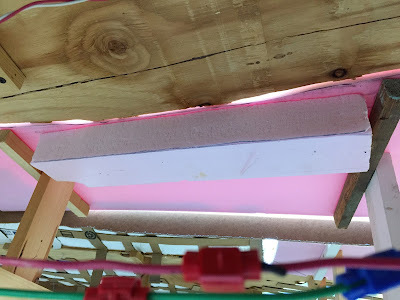 Here's the Ballantine's siding, straddling the plywood and foam as I described above (you may have to click on the image to enlarge to see it). Like Wethersfield Lumber, I decided to provide a level base for the Ballantine's building, as well as the parking lot. The long straight foamcore on the left is the base for Jordan Lane in Wethersfield. 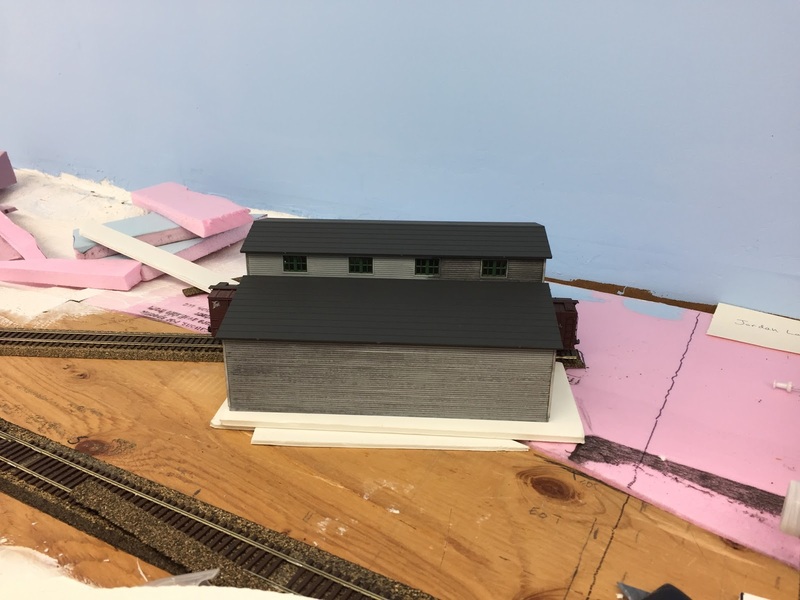 I used N scale roadbed again so the siding will be lower than the main, and also to raise it a little above the plywood. That way I can use a layer of ground goop to provide some subtle undulation to the terrain. Just painting the plywood wouldn't do that. Finally, I used some Aleene's Tacky Glue to glue down the track and my handy-dandy water bottles to weigh it down while drying. Incidentally, you can see a glimpse of the Ballantine's building in the background. 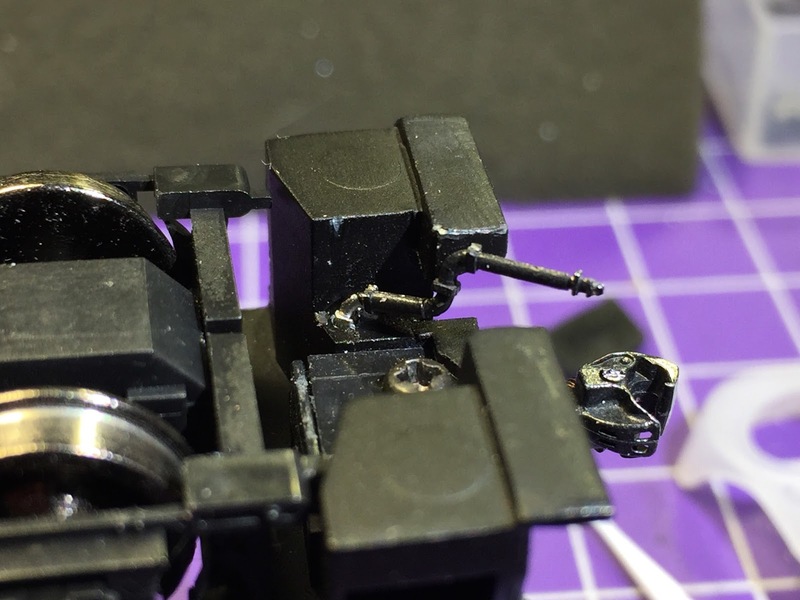 Click here for the build thread. I decided to do a quick paint job to hide all the white, pink, and blue foam. Looks better already! I then used up some left over ground goop to even everything out in the lumber yard lot. 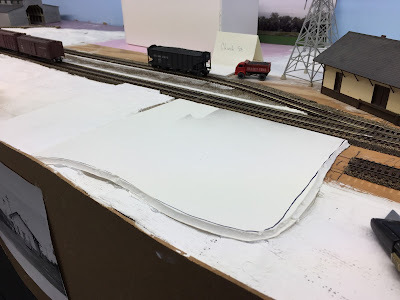 Apparently, I was in the mood for more foam core and hot glue - here I'm providing a base for the Wethersfield station/freight house and lot. Note how I cut the edges at an angle to make it easier to fade in to the surrounding area with ground goop - once I make some more. That's the end of the house track peeking in at the right. 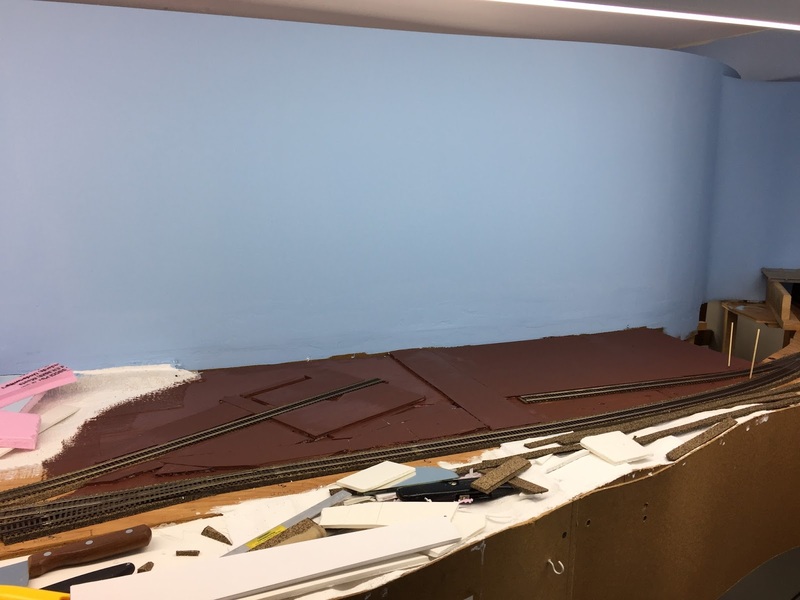 Here's a better photo of the house track/siding - showing the N scale roadbed, split and separated in order to be wide enough to support the track. I'll fill in the space with vinyl spackle later. I made sure the siding was far enough from the main to fit a loading dock/platform in there. I then turned my attention to East Berlin. 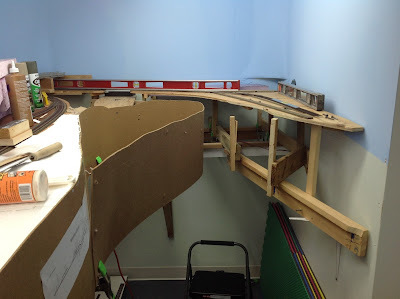 Turns out, this is the last "unfinished" area of the layout, track-wise. The prototype is at the end of a branch that starts at the north end of Middletown yard. 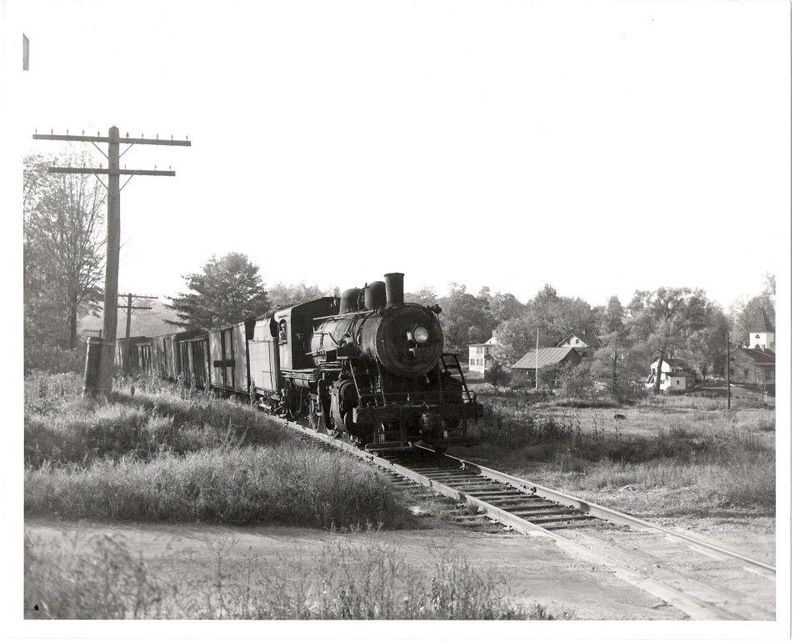 Historically, the line had gone all the way to the Berlin station on the Hartford line - but it had been cut back to East Berlin by my era, and was left in place to serve some local brickyards and Stanley Chemical Co. (makers of paint and such). 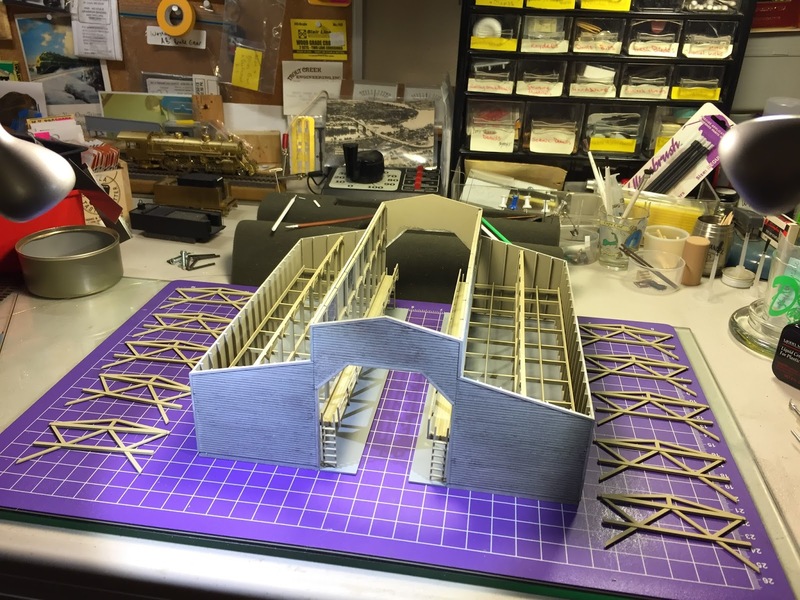 True to the prototype, my Berlin Branch also comes off the north end of Middletown yard, goes across the Mattabessett River on a short plate girder bridge (hidden behind the soldering iron) and terminates at Stanley Chemical (long siding coming toward you). Two main compromises (a.k.a. use of modeler's license): 1) I'll have a brickyard served from the "old main" (track at the back) rather than along the way (there really is no "along the way" between my Middletown yard and the Mattabessett River); and 2) East Berlin is physically right next to Wethersfield (just out of sight to the left). But operationally, it'll work fine. 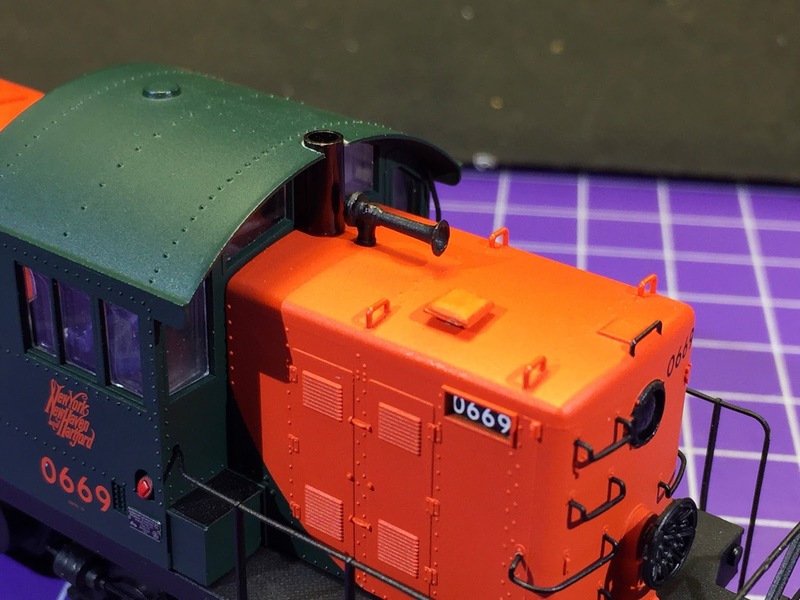 So, not a lot of progress to show - especially given the amount of time I spent - but it was a very enjoyable weekend and even a little progress is better than no progress at all. Remember - you can eat an entire elephant just one bit at a time . . . 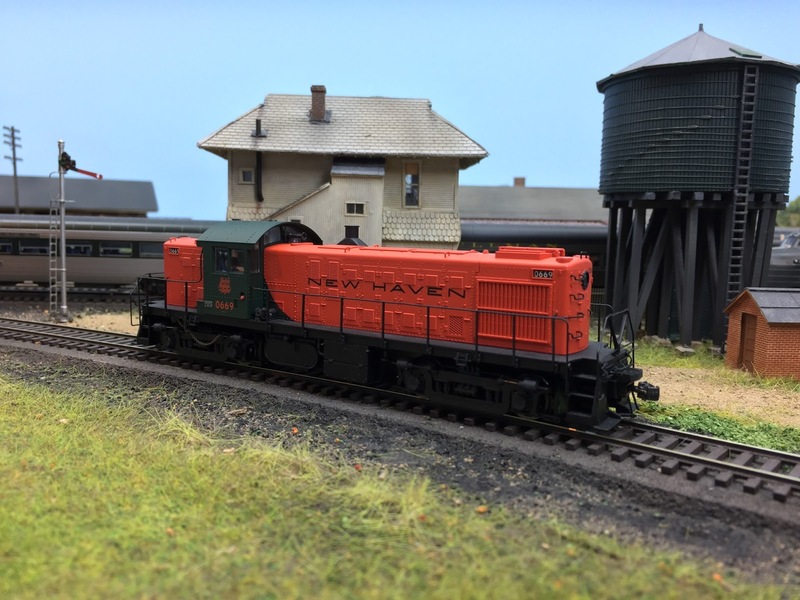 Here's a beautiful shot of a New Haven K-1 class mogul running through a gorgeous scene. Unfortunately, I can't make out the engine number and - worse - I have absolutely no clue where this was taken. I could be the Valley Local, but the NHRR was (in)famous for its complicated web of branchlines which covered all of Southern New England. As much as I'd love for this to be somewhere in the Connecticut Valley, I'm just not sure. Can anybody out there help a brother out? Or at last provide an educated guess? Sure would be great to solve the mystery . . . I've been avoiding running trains on the Shore Line for a while since my I-5 steamer was pretty persistently derailing around the west end loop. The front drivers would just walk up the outside rail and jump the track. 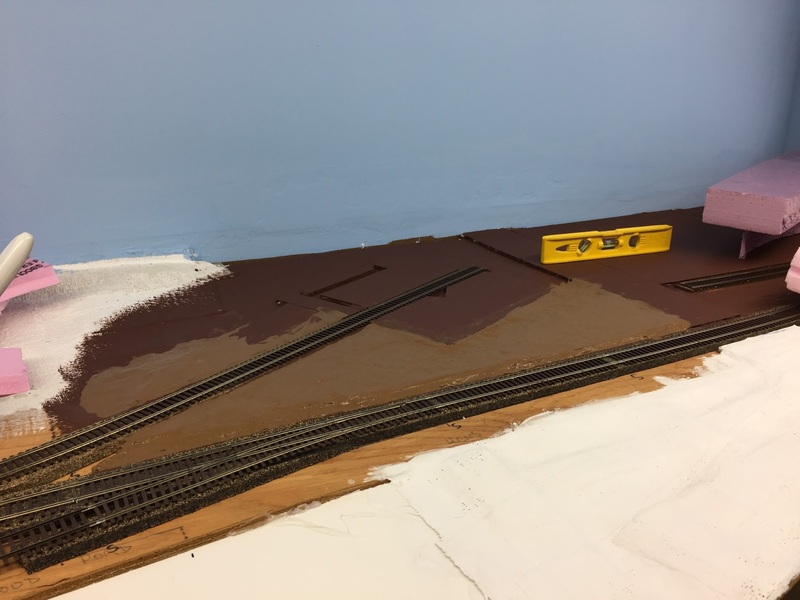 This despite the fact that I have relaid the track here not once, but twice. Most equipment runs ok through here - and I suspected (especially after BillS suggested it) that the loco's drivers might be out of gauge. That would be a major pain. But before even checking that, I decided to do something much more basic - and necessary. 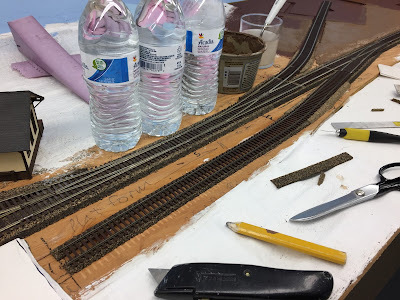 I got out my handy dandy NMRA track gauge and checked the track. I figured if the drivers were the problem, the engine would derail elsewhere and not just in this one spot. 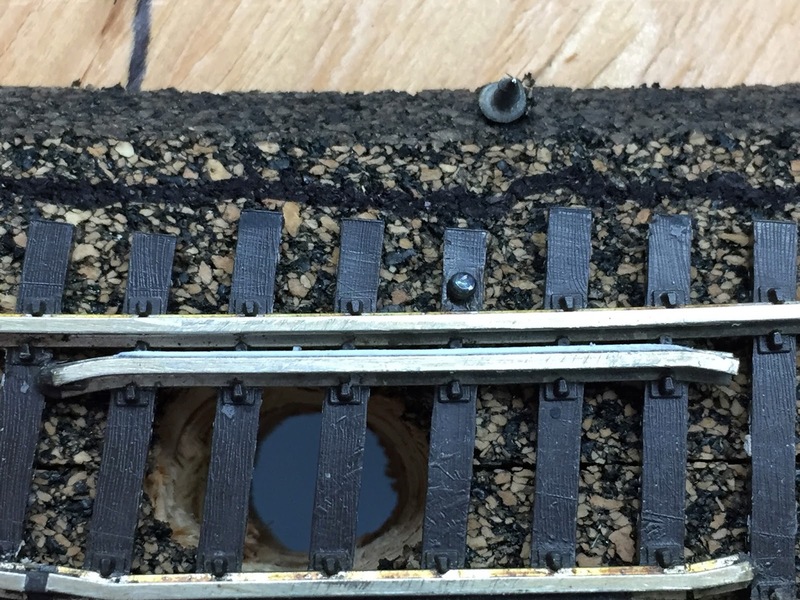 Yup - as you may have guessed already, the gauge on about 12" of track on the curve was a bit tight. 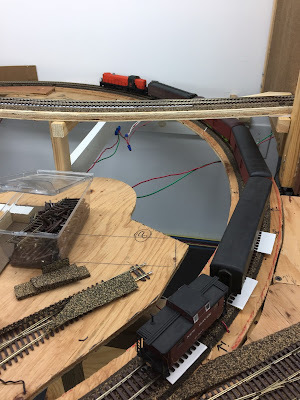 Now, this is Atlas flextrack - chosen 1) because it's much easier to curve than Micro-Engineering track, and 2) it was going to be hidden anyway. But herein lies a problem: the same thing that makes it so easy to curve (i.e. 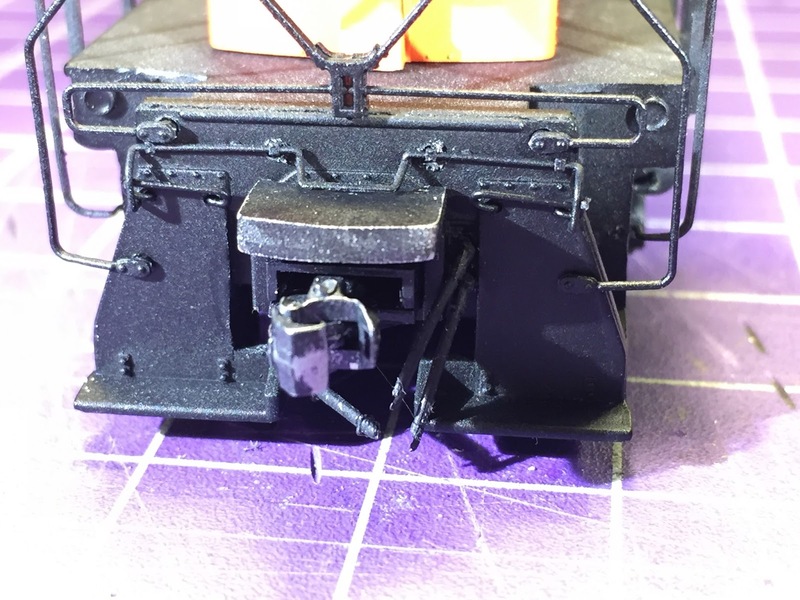 the "floating" rail) also causes it to go out of gauge ever so slightly on a curve. I'd never noticed this problem before. I've always observed "best practices" and solder my joints straight before curving the track (prevents kinks), and position the loose rail on the inside of the curve (easier to cut off the excess). But I discovered - and confirmed others' experience online - that the loose rail tends to push toward the outside of the curve. So if the loose rail is on the outside of the curve, the gauge will tend to be slightly wide as the rail pushes toward the limit of what the spike heads will allow. And - you guessed it! 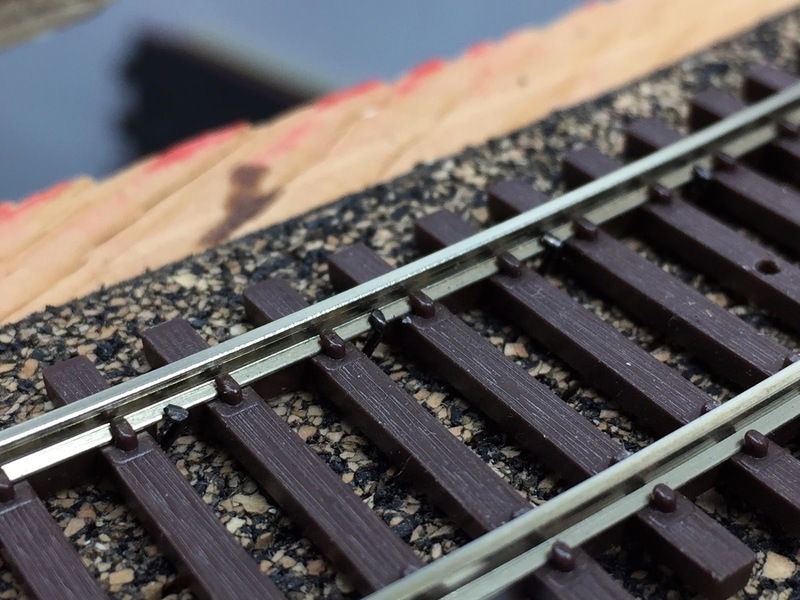 - if the loose rail is on the inside of the curve, the gauge will tend to be a little tight. 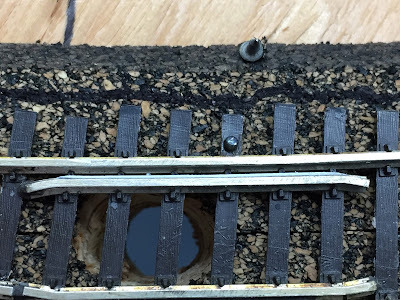 Apparently, that rail can move so easily because there's just enough slop for it to - and enough side-to-side play to cause gauge problems with equipment that's especially finicky. So, what to do? I'd considered ripping out the track a third time and replacing it with M-E track. But I came up with a much better and simpler solution - more spikes! 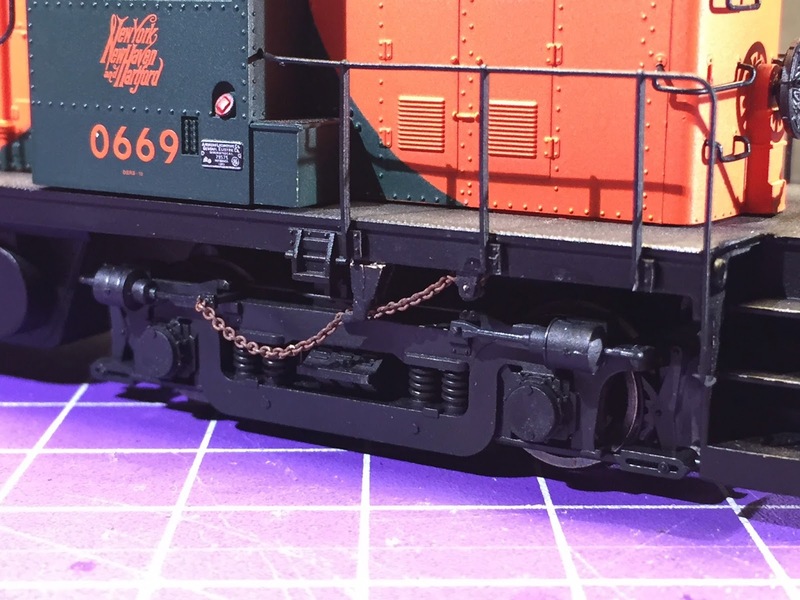 Yup - all I did was use spikes to push the rail back from the track centerline. I had to go every couple of ties (where there's no tie web) since I had to go in at an angle. Pro Tip: Use Walthers #948-360 or some other longer type spike. 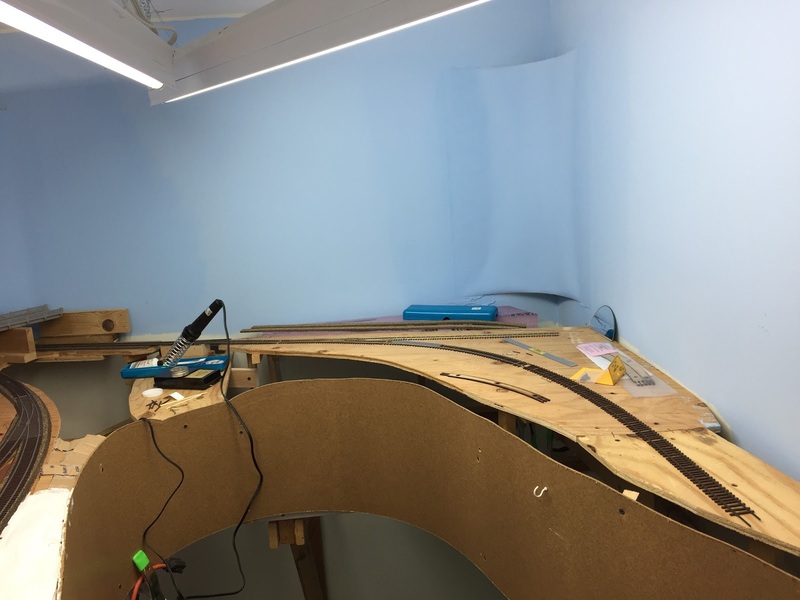 You need to be able to go through the cork roadbed and into the plywood subroadbed, at an angle. Now the I-5 runs through there like a champ! 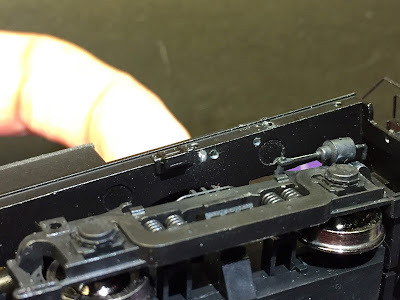 While I fixed the flex, I still needed to salvage a switch. 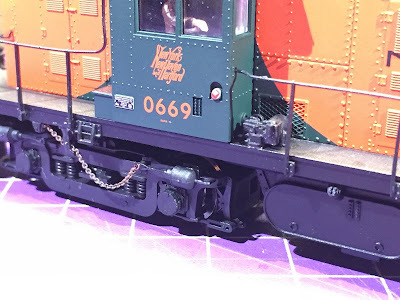 While I had my NMRA gauge out, I checked the flangeways and discovered why some engines (steamers again) would sometimes "hop" through the frog. Turns out, one of the guardrails wasn't quite doing its job of keeping the drivers pulled over away from the frog. Not the best photo, but hopefully you can make out the white HO scale 1"x6" - a strip of styrene .011" thick, ACC'd to the side of the guardrail and filed to fit. This eliminated the slop/sideplay that was causing the drivers to want to pick the frog. Another persistent problem put right. 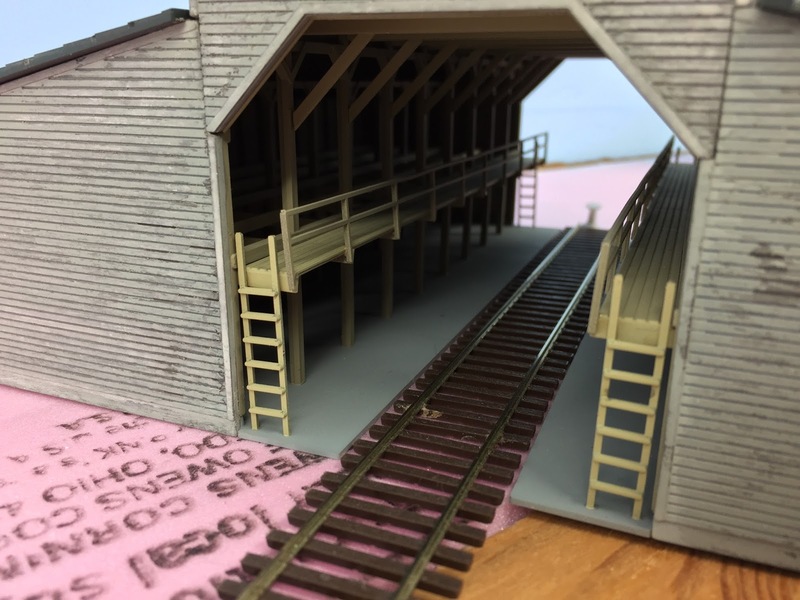 I knew about these two issues and was glad to finally be rid of them - but the Model Railroad Gods weren't done with me yet. 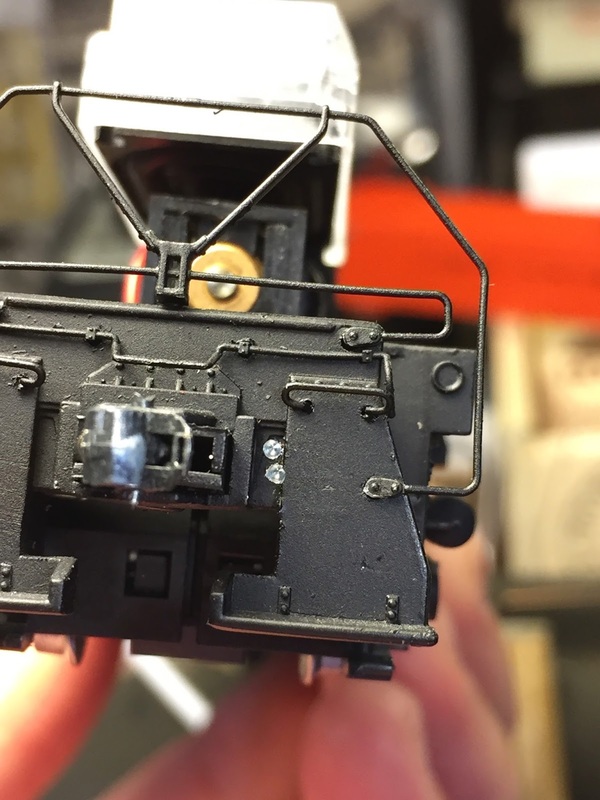 When I went to pull my test train back onto the mainline, I flipped the toggle to line the switch, and - nothing. One of the toggles on my control board decided this would be a great time to stop working. And if the toggle don't work, the switch machine don't work (cuz it gots no power). 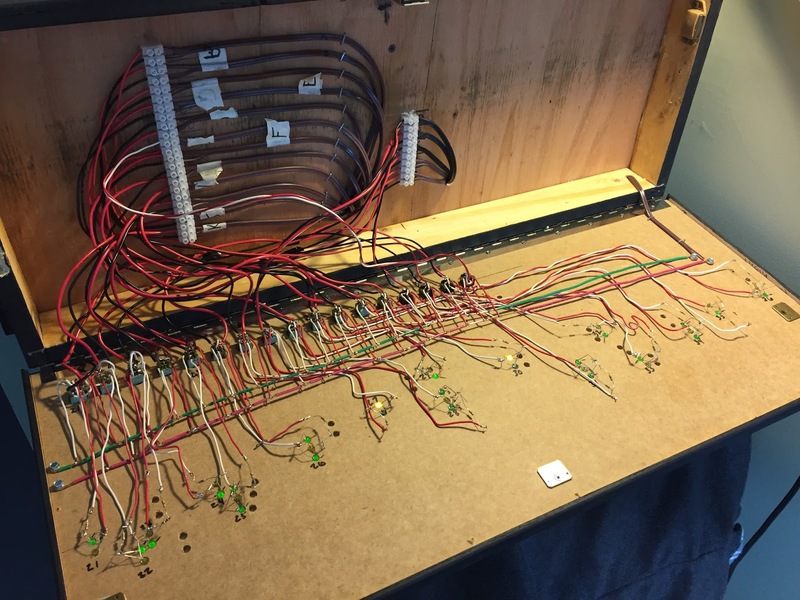 While this looks complicated, well - it IS a bit. But essentially it's one circuit done over and over and over again. LOTS of solder connections and I discovered the problem was that one of those connections was making just intermittent contact. Dunno why. 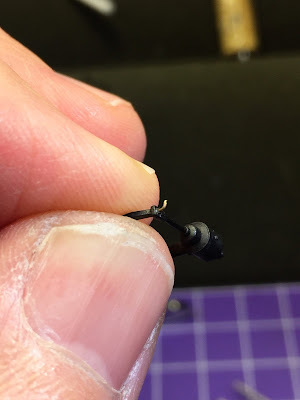 But once I figured that out, I just resoldered the connection and was back in business. 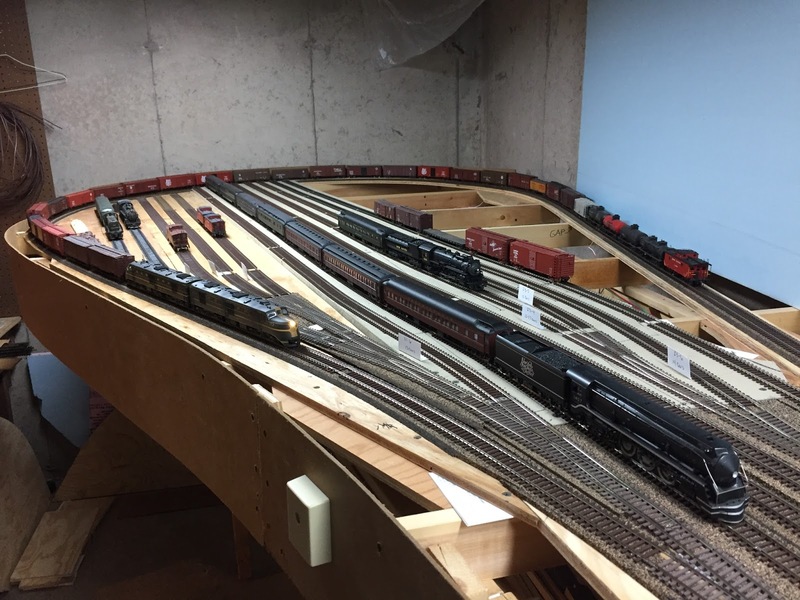 So all in all, not much "progress" to show for all the time I spent on the layout today - but quite a bit accomplished. 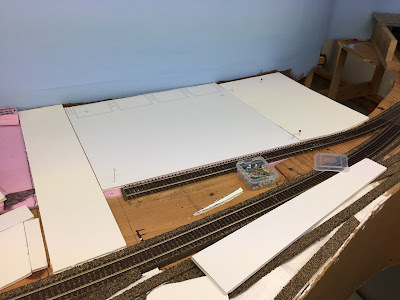 I suspect this is probably pretty standard fare for such a large layout, but thankfully I have good friends to help me with the fun parts (scenery, structures, etc) while I take care of the less fun parts that keep this project moving forward. 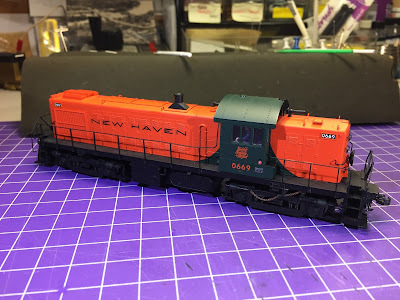 While the Valley Line is firmly planted in the steam era (Autumn, 1947), I experienced a pretty severe case of era creep when Atlas came out with their Loksound-equipped Alco RS-1 in the New Haven's beautiful delivery scheme. The prototype was delivered in the spring of 1948, so I could use one in the Autumn of that year. And once I discovered that the #0669 - the one Atlas produced - was actually used on one of the Shore Line locals, well that cinched it. I had to get one. 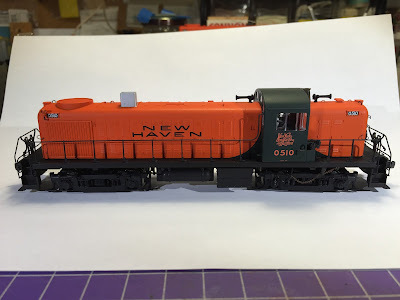 Ever since I "New Havenized" my DERS-2b (Proto 1000 RS-2), I'd been looking forward to giving the 0669 the treatment. I finally got started last October, but between the holidays, ops sessions, and busy time at work, I wasn't able to do much more with it. Until this weekend, when I finally doubled-down and decided to finish it - and did! 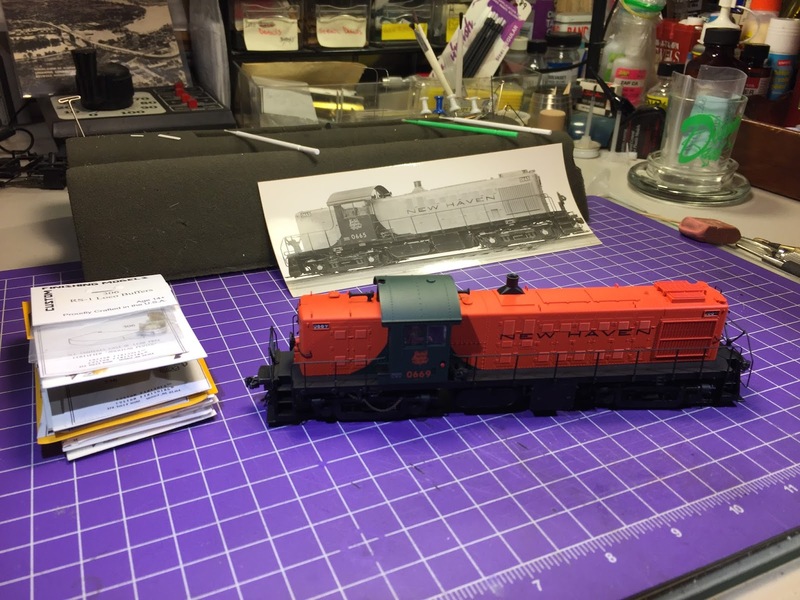 Last time, I'd only gotten as far as drilling the cab roof and installing the brass tube for the steam generator exhaust stack. So I continued by installing the hand brake chain and guides. The chain has to attach to the brake valve pistons somehow, but you try to drill a hole through that little nub (the end of the brake lever sticking through the "clevis" at the end of the piston). I opted to just file that off to provide a flat area for drilling a #80 hole. I then inserted a piece of .0125" wire, bent up into a hook at the end that I could use to hang the chain on. Next, I drilled the mounting holes for the chain guides. Prototype photos are absolutely critical for determining location. As you can see, I had one false start. It's not easy drilling such small holes into the metal frame, but I made a dimple with a safety pin, lubricated the bit with bar soap and used my foot pedal/flex shaft Dremel combo to regulate the speed, backing out often to clear the metal shavings. Didn't break a single bit! I threaded the chain through the guides before gluing the guides in place. Much easier than trying to thread them afterwards (ask me how I know!). 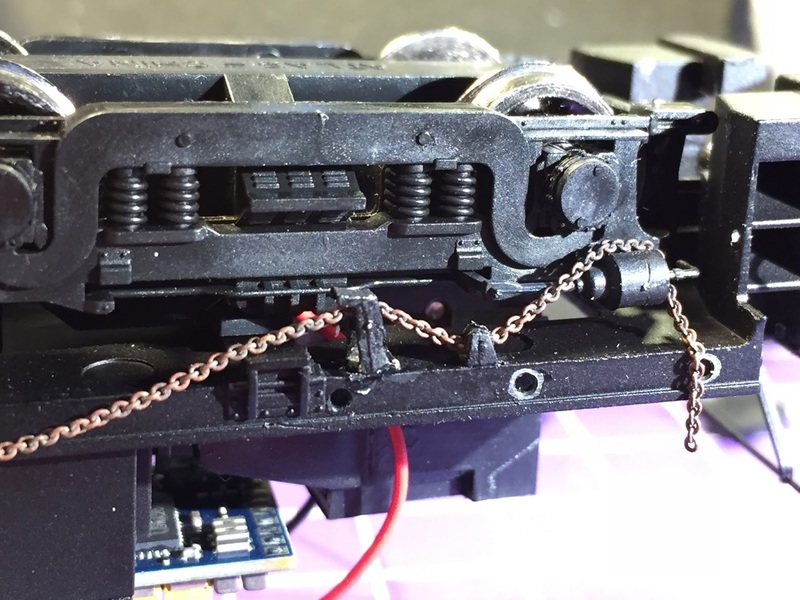 Be sure to ream out the holes in the guides so that the chain goes through easily. I then glued them using gap-filling CA and - once in final position - I touched them with CA accelerant. That creates an instant, and secure, bond. 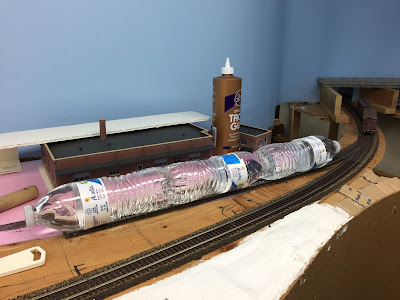 I love this combo for just about all my non-styrene gluing. Click here for more about it. I glued the rear end of the chain to the small guide, trimmed the chain to length (determined by swiveling the truck to its extreme), and hooked it on the little hook I'd installed on the end of the brake piston. It was SO fussy trying to do that that I decided to go ahead and glue that end of the chain as well so it wouldn't ever fall off. The photo above shows the final result. Next, I drilled mounting holes for the BARCO steam heat pipes and glued them in place, using my favorite CA/kicker combo. The Atlas model comes with LOTS of detail already in place (unlike the Proto1000 RS-2, which had almost no detail at all - not even grab irons!) , including a brake hose. But that brake hose didn't look that great (no valve), and I needed a signal hose as well, so I figured I'd next drill a couple mounting holes and glue nicer-looking ones in place. 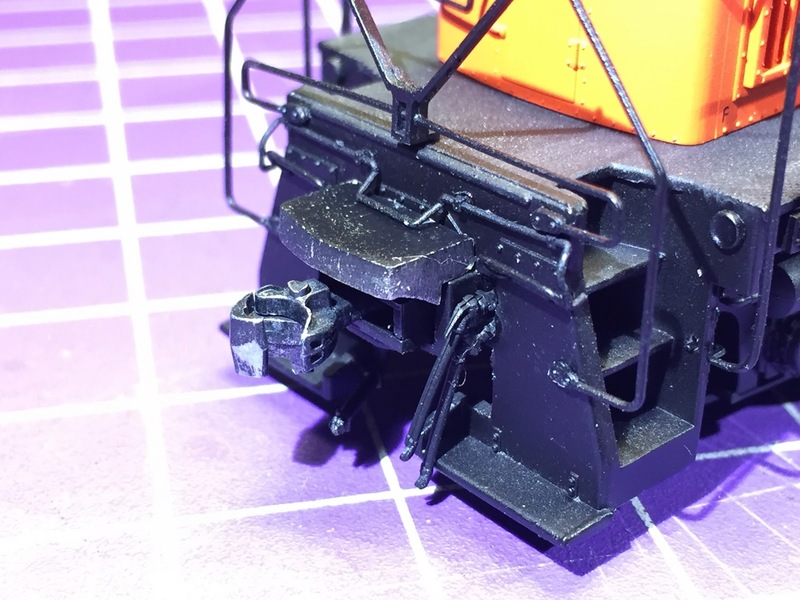 The easiest detail to prepare (only needed painting) but the hardest to install (since there were no mounting lugs) was the diaphram buffer. I used contact cement to mount it - and hope it holds. Like on the RS-2, the RS-1 has a brake equalization valve on the running board, but it's in a different location - in front of the engineer instead of behind the fireman. Once the frame/end details were curing, I turned my attention back to the hoods. 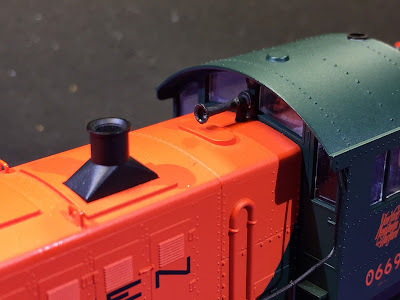 As I mentioned, I'd already installed the steam heat exhaust stack (including drilling a precise hole through the cab roof - free hand), so I next installed the rear horn and intake stack (aka "mushroom" vent). Full Disclosure: while I could find no blueprints/dimensions for this detail, I think it's on the small side. But it's still not as small as the part that Custom Finishing recommends. It'll do for now - at least until I wanna bother scratchbuilding one. Still looks pretty good. And here's the front horn. The Atlas model has the horn coming out of the front of the cab. Not cool (or correct), so you have to fill that hole and drill a new one. But the result is worth the effort. Once that was done, so was I. 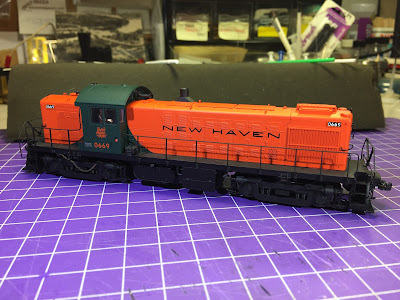 All that was left was to take a couple of "builders photos"
But all in all, despite these minor (to me) compromises, I'm very happy with how the 0669 turned out - and am especially happy it's finally done. All I have left to do is some minor touch-up and weathering. And then I can get back to working on the signature locomotive of the Air Line Local (and star of the blog banner above): J-1 class mikado #3022!